If you’re aiming for a home TV gaming console feel, things are super easy: a variety of USB-compatible gaming controllers exist that’ll plug straight into the Pi and you’re done! If aiming to simulate a particularly nostalgic console, chances are you can find an equivalent controller in USB format. Look around a site like NewEgg or just Google search for some options…I’ve seen classic-style controllers resembling the NES, Genesis, Playstation and more, as well as USB adapters if you’d prefer using actual original controls. 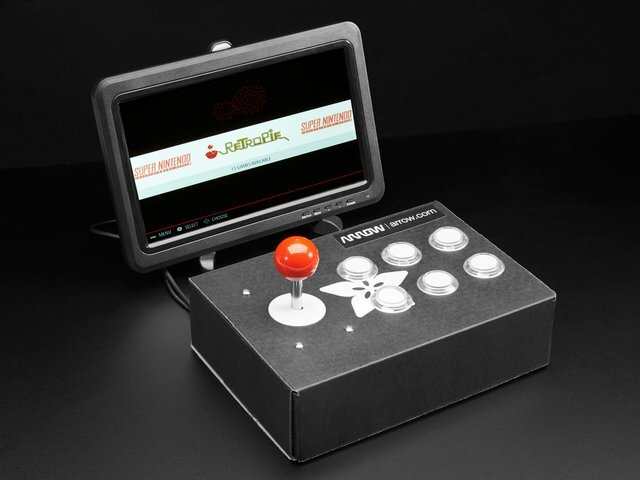 Just as there are USB console-style controllers, so too are there USB arcade-style setups. They’re often a bit costly though…also, nearly all of them are laid out for 1990s fighting games. If the ready-mades meet your needs, fantastic. But maybe you want something simpler, or may have ergonomic preferences (I’ve always prefered right-handed joysticking, for example). Making your own control box (or even a whole cabinet) is a satisfying DIY project! This is where things take a creative turn. There’s no One Right Way™ to arrange controls that can cover every game. Instead, pick a few favorites and devise a layout that handles the most frequently-used inputs well. For everything else, you can still use a keyboard. You’ll also need to build your control panel using the materials and tools best suited to your own skills. I’m fortunate to have access to a laser cutter that can work with acrylic, but that’s a tall order for most. Scrap plywood or a metal project box are viable materials (a cigar box works great too! ), while a drill, hole saw, Dremel tool or wood rasp are all reasonable tools for making holes. Improvise! Our Small Arcade Joystick is the gamer’s equivalent of the IBM Model M keyboard — clicky and built like a tank! This is an 8-way “digital” joystick. Most classic games are designed for this type of stick, and it’s easy to interface…the Raspberry Pi can’t read proportional “analog” joysticks directly. 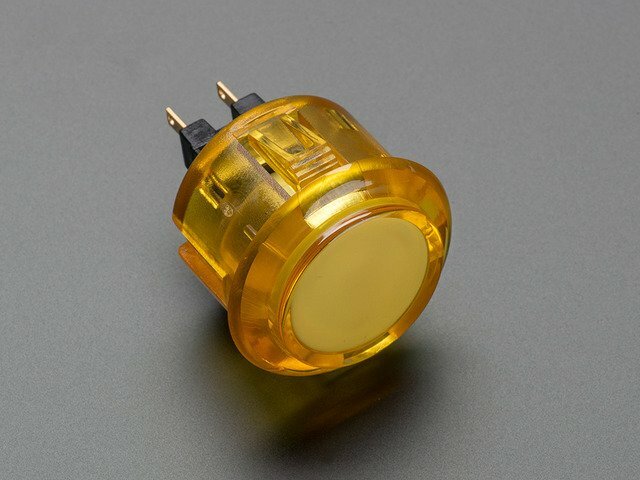 Our 30mm Arcade Button is available in six different colors and is similarly industrial-grade. Any momentary push-type button (“normally open” contacts) will also work. 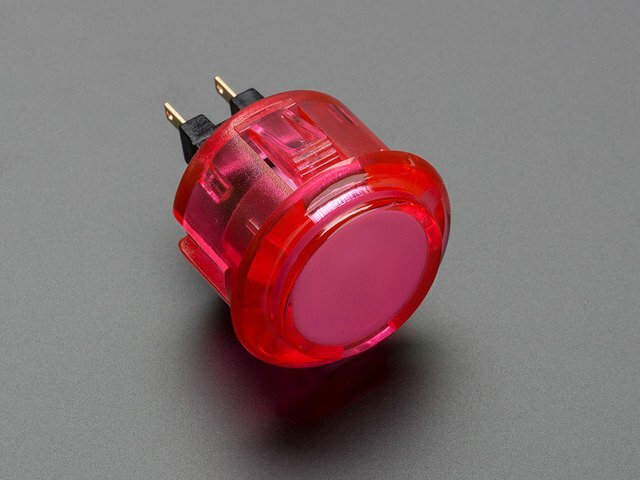 Large (60mm) and Massive (100mm) arcade buttons come in five colors and are irresistible! These bigger buttons are typically seen on quiz games rather than fast-twitch shooters. A classic Atari or Commodore joystick can also be used, since these are just passive switches internally. 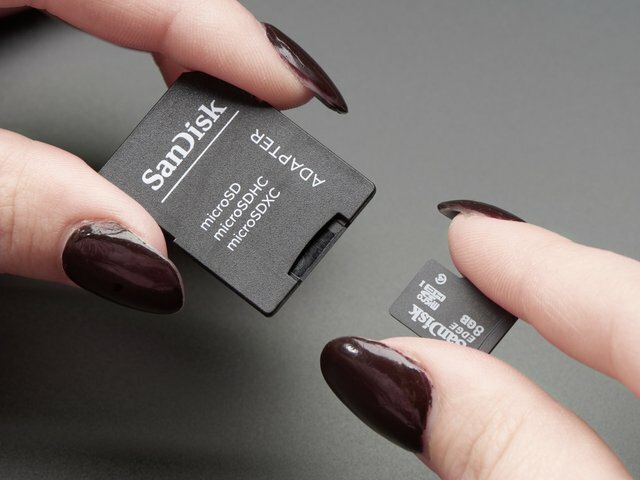 Most later gaming consoles used serial protocols for their controls…unfortnately those won’t work here…but as mentioned previously, USB clones exist for most. We offer a variety of arcade controls, but we don't sell COMMON SENSE. When drilling and cutting, take precautions such as wearing SAFETY GLASSES, always cut AWAY from yourself, etc. The controls will be wired to the 40-pin GPIO (general-purpose input/output) header on the Raspberry Pi board. Early model Raspberry Pi boards had a 26-pin header…same idea, just with fewer spots to connect things. 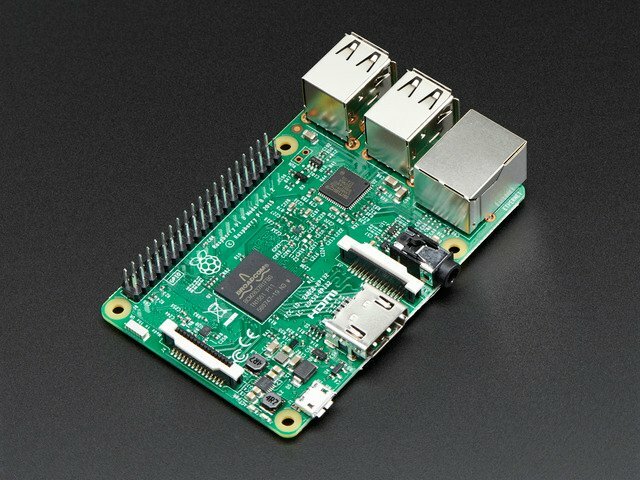 Each pin on this header has a unique “GPIO number” …not in-order, but we provide a map below for translating. Buttons and a joystick (each of 4 directions) will connect between any available GPIO pin and a ground (GND) pin. All of the green pins are fair game for connecting buttons. GPIO2 and GPIO3 are off-limits if using any I2C peripherals (for example, most real-time clock boards). GPIO14 and GPIO15 are off-limits if using the TTL serial port (for example, with a serial console cable, or thermal printer). If using one of our PiTFT displays (as most of our portable gaming projects do), another seven GPIO pins are out of commission: GPIO7-GPIO11 and GPIO24-25. Our I2S audio amplifier board needs GPIO pins 18, 19 and 21. Avoid red pins, these carry power and aren’t suitable for controls. Black pins are ground points. 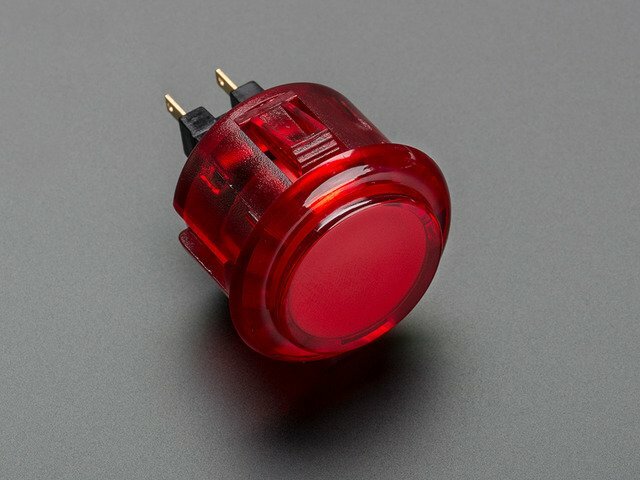 The other leg of each button (and the “common” pin from a joystick) will need to connect to one of these. There are several scattered around…if you need more, one of our small Perma-Proto boards can be used to provide a single large “ground rail” where one side of all the buttons can be connected. Alternately, if you have extra unused GPIO pins and just need a couple extra ground connections, we’ll show a software work-around for this. Do I need Pull-up or Pull-down resistors? You do not need external pull-up resistors for the buttons or arcade controller…they can wire direct to the GPIO pins and grounds. The Raspberry Pi has its own “internal” pull-ups. Just as the layout and build technique of the control panel requires creative interpretation, so too will you need to decide on your own wiring methodology. We have some parts that can help. 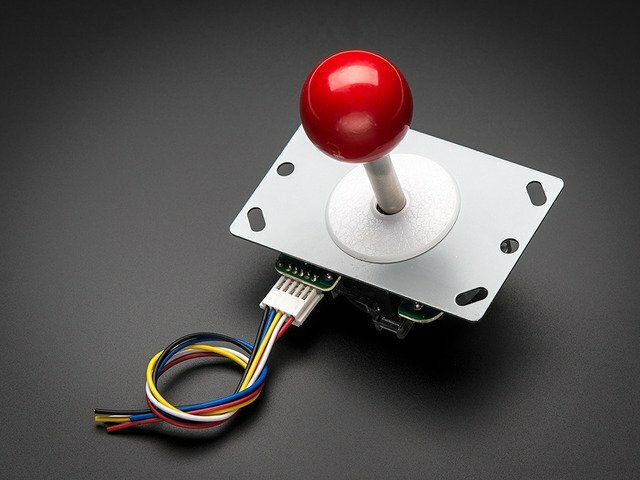 Aside from the aforementioned Perma-Proto board, there are quick-connect wires that work with the buttons and jumper wires in various lengths that can be used with a joystick or plug directly into the GPIO pins (without a Perma-Proto board). Options abound! You’ll likely need some combination of these, and may need to solder some connections. Here’s a pinout diagram for our arcade stick. Only one wire needs to go to GND, then each of the other four goes to a different GPIO pin. These directions apply when the stick is oriented with the header at the top. It’s fine to install the stick in a different orientation, you’ll just need to adapt the wiring connections to match. Here’s a basic no-soldering wiring setup we use for TV gaming with one joystick and two buttons, using 5 female-to-female jumpers (small white squares) for the joystick and two unmodified quick connects (larger white rectangles) for the buttons. Notice how the quick connects each span a GPIO and adjacent ground pin. It’s a pretty basic layout, but sufficient to accommodate quite a few classic games. For the remaining seldom-used functions (coin insert, start game), a regular USB keyboard is kept nearby. An example case I made from laser-cut acrylic, but any workable material will do. A cigar box makes a great fit! The case should be at least 50mm (2 inches) deep to accommodate the buttons and solderless connectors. The shelf at the top holds a small USB keyboard. This is a catch-all for seldom-used functions (e.g. coin or game start). Only the essential controls were assigned to arcade buttons…but keep adding others if you like! This layout avoids most of the peripheral pins (e.g. I2C), but does use pins that would be required for a PiTFT display…so this is only viable if using HDMI or composite video out. This is mostly due to the size of the button quick-connect plugs. Trimming the flanges off with an X-Acto knife, you can probably create a more compact arrangement. “A”, “B”, “X” and “Y” here refer to the controller button names used in EmulationStation, not necessarily the keys to which they’re assigned. For handheld projects, the principles are the same as above, just squeezed into a very constrained space. Smaller components are used and the connections are a bit more challenging. You’ll find examples in our PiGRRL, PiGRRL 2, Pocket PiGRRL, PiGRRL Zero and Super Game Pi projects. Most of these use a PiTFT display, so there’s a set of GPIO pins that are off-limits. Otherwise, it’s all the same idea…buttons wired to GPIO and ground pins. 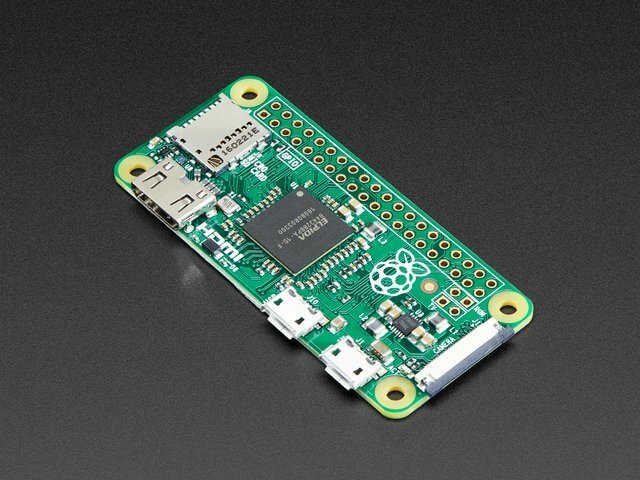 The Raspberry Gear project uses a different approach…a microcontroller acts as an intermediary to the Pi’s USB port. This guide was first published on Jun 03, 2013. It was last updated on Jun 03, 2013. This page (Adding Controls: Hardware) was last updated on Apr 21, 2019.